What would you do if you knew the world was ending? If you’re anything like the protagonist of Wandersong, you would do anything in your power to stop the end from coming. Using only the power of song, and friendship, you can embark on your very own world-saving journey in this new puzzle platformer. Here’s our nameless bard, referred to as they/them by the developer, accompanied by Eyala from the game’s introduction. Wandersong begins with a compassionate bard discovering that their powerful voice allows them to be transported to different planes. You meet with a colorful citizen of one of these planes – her name is Eyala. She explains that the world is ending soon, but that that you may be able to save it if you obtain all of the pieces to the Earthsong from the six Overseers of different areas of the world. For a bard with a heroic nature, that is a one-way ticket to an adventure to save the world! Each Overseer requires a song to be sung at a special access point in the town they reside, and as the bard you must travel to these towns and learn this Overseer Song. Each level of the game is broken into acts and scenes’which contain levels to progress towards the Overseer or their song. These levels are unique, well-thought-out and contain a set of puzzles which differ from act to act. These puzzles elevate in difficulty throughout an act and at times can be quite tricky to solve. Use singing to change the colors of flowers, birds and more in each level. 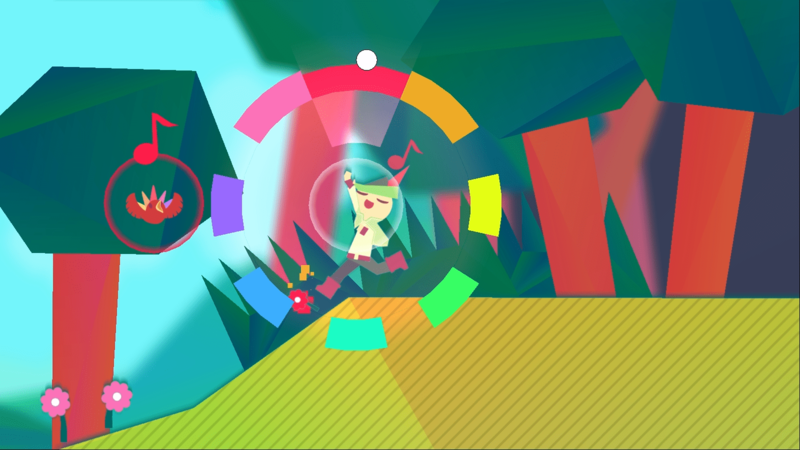 Graphically, Wandersong brings to the table an interesting take on environmental art. Each town and Overseer’s stage has a different color palette and environment, giving the game a great deal of variety. Color is not at all lacking in any of the scenes and many animals and plants react to your singing by changing color themselves. The only downside to the art in Wandersong is that at times it appears in a way that seems unintended. Sometimes the outlines around characters appear pixelated, as if they were copy and pasted without blending. Additionally, scenes become blurred, which seems unintentional. However, these instances are few and far between, as the game has an overall finished feeling. The great art in this game is accompanied by some music that is equally beautiful. Musically, this game is a cozy, whimsical experience, and it makes me want to listen to it over and over again. From background music to the songs you sing as a bard, there is a wonderful collection of tunes to be heard. One of the best ways to interact with NPCs is through song, and at times these songs are so beautiful they might make your eyes water. For a game that relies so heavily on music, Wandersong definitely hits the high notes. Music is used as a tool or way of communicating, never as a weapon. You might notice that I haven’t brought up combat or combat controls yet. That’s because in Wandersong, you will not be battling as a bard. One of the most beautiful elements of this game is your interactions with the environment, puzzles and NPCs. All interactions are done using a wheel of eight colors which, on the Nintendo Switch, is controlled using the right control stick. Our protagonist is a gentle soul who believes that there is no need to harm others in any way. This bard is so peaceful that at one point, while in a cave, they specifically stop both themself and a yeti companion from accidentally stepping on bugs. Where most games require some form of combat or violence, Wandersong takes a new approach on how to interact with the world and make it a better place just like that bard would want. You’ll often get praised for your positivity in Wandersong. In addition to a lack of actual combat and wonderfully-designed interaction controls, Wandersong creates a great connection to NPCs by writing the bard to be a delightful person and reinforcing that through the interactions you have in the game. At almost every corner is a chance to help out others. Your partner, a witch named Miriam, often advises against helping, but by aiding others you are able to both advance the story and build connections with a great cast of characters. From reuniting a girl with her mother’s ghost, to creating sweet jams for businesses, there are a variety of methods to make other people happier in a way that put a constant smile on my face while playing. Helping out doesn’t even stop with humans – often you are faced with situations where you help different animals or creatures in the world that later help make puzzles easier to complete. Wandersong is a heart-warming, cozy adventure wrapped up in a beautiful, wonderfully composed box. With a unique cast of characters, head scratching puzzles, and a story that will warm your heart, this game will have you wanting more from this gorgeous world after the credits roll. There are a lot of indie titles coming out every week that you can add to you Switch, so make sure that this is one of them. Michelle reviewed Wandersong on the Nintendo Switch with a code provided by the developer. Michelle is a student in Media Communications and lover of video games. She is devoted to her PS4 but you can just as easily find her on her Switch, iPhone, 3DS, or really anything that plays games. She also hosts and produces a retrospective gaming podcast. In her personal life she and her husband are proud owners of 3 dogs and an almost complete amiibo collection.